Starring Dennis Ruel, Ken Quitugua, Jose Montesinos, Sari Sabella, Vladislav Rimburg, Sam Hargrave, Emmanuel Manzanares, Edward Kahana, Steven Yu, Roy Chen, Miguel Padilla, Shawn Bernal, Alvin Hsing, Gui Dasilva, Tony Chu, Andy Le Brian Le, Jimmy Chhiu, Yoshi Sudarso, Amy Johnston and two surprises! LBP Stunts Chicago. The Stuntpeople. Vladislav Rimburg. Dennis Ruel. Emmanuel Manzanares. All of these names have been spoken of ad nauseum on this website since its inception in 2010. I’ve championed their fight choreography and work in short films, citing that the Powers That Be in Hollywood should let these guys take the reins choreographing and directing big—or at least modestly budgeted— action films. Now action man and director Dennis Ruel (Rope-A-Dope 1 and 2, American Brawler) finally brings these talents together to pay homage to the Jackie Chan/Sammo Hung/Yuen Biao films of the 80’s, particularly the Lucky Star series of films. This is a tall order, and a major ambition where the talent involved could fall flat on their faces. Nope. 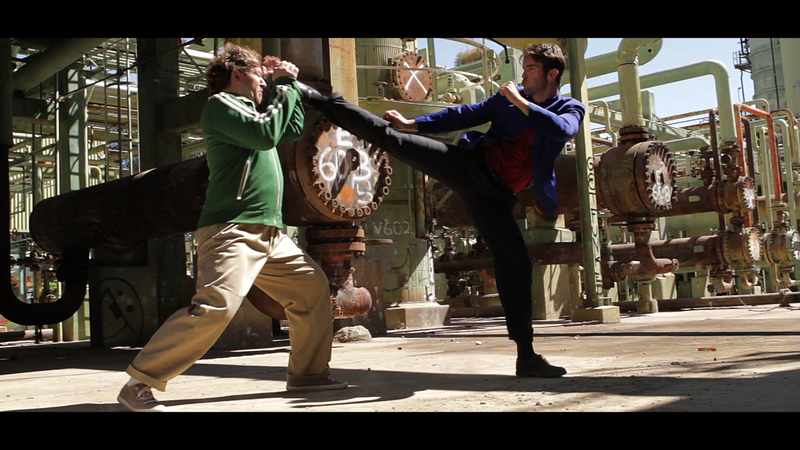 Unlucky Stars hit the ground, flipped, kicked, and punched their way to cinematic awesomeness. Unlucky Stars lives up to its name and goal. Sammo Hung would be proud, as this film is exactly the kind of film he would’ve tossed Yuen Wah, Richard Ng, and Eric Tsang into. While the story contains a lot of characters to follow, it ties their separate stories perfectly into the main narrative confidently. The comedy moments work for me, in a world where martial arts dominates…well, everything. Every moment flows smoothly from one piece of insanity to the next, and the action is never far behind, even in small moments. The acting is great, and not a sour note in the bunch. Dennis Ruel and Ken Quitugua are great together as the investigative duo (very much a Jackie Chan/Yuen Biao pairing), and Vladislav Rimburg hits every note as the Sammo Hung-inspired Palatnikov, and Sam Hargrave is charming and funny as the bad guy Sam, and Sari Sabella is hilarious as the dimwitted, hapless Sameer, and brings a natural innocence to the character. It’s obvious that everyone worked their asses off and had a ton of fun doing it, and it shows onscreen. Yes, this moment reminds me of a little movie called Dragons Forever! This film is made for those of us who love martial arts films, particularly those made in the 80’s. See if you can find all of references. Everything from Y. Kurata Sushi to Golden Harvest Investigations to so much more (the opening of the film tells you exactly what you should expect) you’ll re-watch the film to catch the small things you’ll miss the first time. Even the final fight is an ode to the final fight between Sammo Hung and Richard Norton in Twinkle,Twinkle Lucky Stars, right down to the suspenders. There are not one, but two special guest stars, and I won’t spoil them, but one appear at the end of the film, and may hint at what may happen in the sequel (?). The fights are as fantastic as you would want them to be, and there are so, so many good ones, from the church fight that brings out so many talented stuntmen/actors like Gui Dasilva and Tony Chu (this scene has my favorite character, an homage to the great Yuen Wah. Cigar included.) to the fight both inside and outside of the Celebrity Rehab house, and the terrific finale at a factory which contains a great fight between Rimburg and Hargrave. Sam Hargrave (Captain America: The Winter Soldier, The Avengers) goes through some fantastic falling stunts as he bounces himself off of a LOT of metal objects. Amazing action talent plus a great story that serves as a love letter to the Lucky Stars film series, and to 80’s HK action cinema as a whole. Not to be missed! Previous This Month on Kiai-Kick–now on Video! 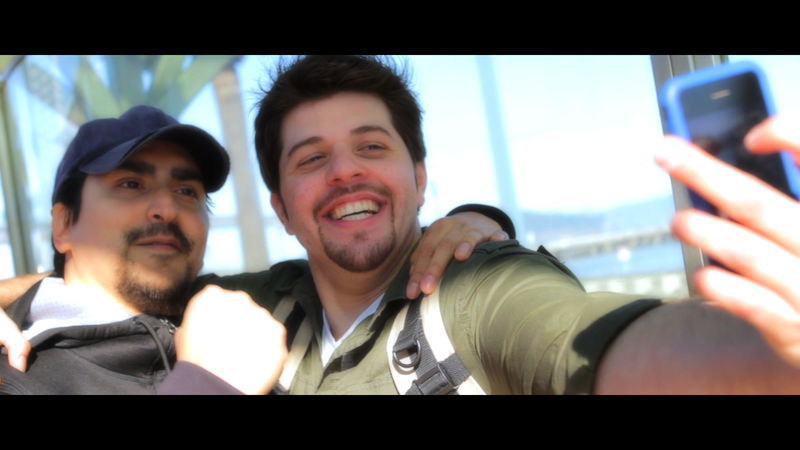 Including a look at my webseries Cornered!